rec. Chapelle du Grand Séminaire de Montréal, Montréal, (Québec), Canada, June 2013. DDD. The programme begins and ends with five-part settings of the Offertory for the second Mass of Easter Sunday, first by Byrd and then Palestrina. The Byrd is short and sweet, as befits a setting intended for illegal celebration by a recusant community in permanent fear of discovery. The Cardinall’s Musick/Andrew Carwood on ASV CDGAU214 – Recording of the Month, DL Roundup November 2010 – despatch it even more quickly – 0:48 against 1:05. It thereby achieves a greater sense of the action – the earth trembled and was still when God arose to judgement – but at the expense of the poise which Jackson finds in the music. Once a very rare beast, the Brumel ‘Earthquake’ Mass, a work in which the great Lassus once sang, has become almost a repertoire standard in recent years. The nickname is derived from the fact that the cantus firmus, the musical structure on which the Mass is founded, is the Passiontide antiphon Et ecce terræ motus – and behold there was an earthquake. The final section of the manuscript containing the Agnus Dei has been badly damaged but has been reconstructed for this recording. The earliest recording, by the Huelgas Ensemble and Paul Nevel, dating from 1991 and originally for Sony, is available again on the Newton label – review – but my benchmark is the version made by The Tallis Scholars which followed hard on its heels (Gimell CDGIM026 or, for very little more, on a budget-price 4-CD set Sacred Music in the Renaissance 2, GIMBX302: Bargain of the Month – review and December 2010 DL Roundup). Regular readers will not be surprised to discover that, although Jackson finds more poise than Carwood in the Byrd, the new recording of the Brumel is consistently somewhat faster than the Gimell, markedly so in the Agnus Dei, where a different edition has led to a shorter version. Listen to the new Atma recording and you will be treated to a persuasive performance of some wonderful music. Heard in its own context you will probably find it very satisfying, but change to the Gimell version and the more reflective pace gives the music more time to expand. The consensus doesn’t have to be right but the Tallis Scholars are in line with the pioneering van Nevel recording, the Stuttgart Schola Cantorum (Brilliant Classics – review) – both of these even more slowly paced than the Gimell – and the Tudor Consort (Organism). A recording by Dominique Visse (Harmonia Mundi – deleted but Amazon have a few in stock at a premium price) gave the music even more space. Only The Sixteen under Harry Christophers come at all close to the tempi on Atma. (Coro COR16097: The Earth Resounds – DL Roundup March 2012/1). Nor do we know what tempi Brumel envisaged or Lassus sang but The Tallis Scholars seem to have it right. The new Atma recording gives us, as it were, the aural equivalent of a great cathedral; from Gimell we see individual constituents of that cathedral. To take two examples, the impassioned repeated cries of eleison, have mercy, in the central section of the Kyrie, and their Latin equivalent, miserere nobis, in the following Gloria, gain in power on Atma, but I prefer the generally more thoughtful nature of The Tallis Scholars’ version. The Tallis Scholars round off their Brumel programme with the Lamentations, also included in the collection on GIMBX302, but the Magnificat unfortunately isn’t in the box set and there are no alternative recordings – you need the original CDGIM026 for that. It’s often difficult to keep up with the different permutations of Gimell recordings in 1-, 2- and 4-CD formats. Christopher Jackson completes the new album with other music by Renaissance composers connected with the theme of fear and trembling, so that it becomes less Easter-themed than the title suggests and more concerned with the Last Judgment – that day (diem illum) on which the text of the Vaet work meditates with trembling. Lassus’ Timor et tremor is the best known of these other works and here again my comparison is with The Tallis Scholars (CDGIM048, with Missa osculetur me and other works by Lassus). Once again, though enjoying the new recording, I prefer the way in which the Scholars give the music significantly more time to develop. In the Vaet and Créquillon works the new recording has the field to itself. With no other recordings for comparison it’s easier to appreciate the quality of the singing and direction of Jackson and his team. 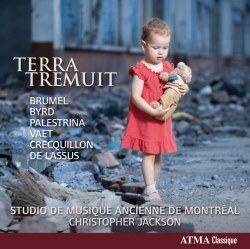 We return to terra tremuit on the final track, this time from Palestrina. There are three very fine recordings of this, all with other music by Palestrina: Hyperion CDA67978, The Brabant Ensemble/Stephen Rice – DL News 2013/6 – and The Sixteen/Harry Christophers, on the third volume of their Palestrina cycle, Coro COR16016 – DL News 2013/4 – or on a 3-CD set entitled The Queen of Heaven, COR16108. As on track 1, Jackson on the new Atma recording gives the music time to breathe, taking fractionally longer than Christophers or Carwood. The Sixteen and The Cardinall’s Musick sound a touch brighter, though there’s otherwise little to choose between them. I could have been very happy with the new recording had I not known those earlier recordings of the principal work, the Brumel Mass. There I remain loyal to The Tallis Scholars first and foremost and their recording comes either coupled with other music by Brumel or as part of an extremely good value package. Put The Scholars out of mind and the Atma is very enjoyable and never less than professional. In the Byrd and Palestrina there is little to choose between Jackson’s team and his rivals and two of the works recorded here are not available elsewhere. The recording, too, is clear and immediate and the booklet adds to the appeal of this recording.